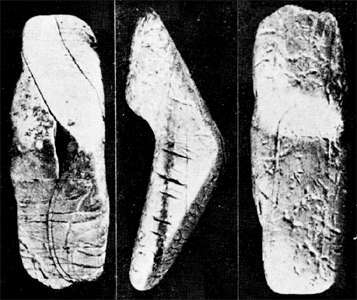 The Krasnii / Krasnyy Venus was discovered in 1957. It is a highly stylised female figure in bone, carefully polished. On the front, a projecting angle, located in the upper third of the height, represents the breasts, while the posterior face is divided into two equal flat surfaces, forming a blunt obtuse angle, which represents the protruding buttocks; transverse parallel striae, short and irregular, mark the posterior and the left side of the statuette. Location of Krasnyy Yar (Red Ravine). 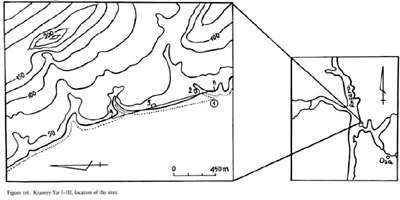 The site of the locality of Krasnyi Iar occupies a special position among the sites of the Angara Palaeolithic known at the present time since it represents, for the present, the sole example of a stratified Palaeolithic site for the Angara River. Seven temporally distinct cultural horizons were recorded here. In 1957 and 1959, a team under the leadership of Z.A. Abramova worked in Krasnyi Iar. As a result, an area of about 260 square metres was excavated to a depth of 3.15 metres, and three cultural horizons were established. Abramova continued excavations in 1964 and 1965, and in 1965, 568 square metres were excavated to a depth of 4 - 6 metres at the site, which was already considerably destroyed by the rising water of the Bratsk reservoir. 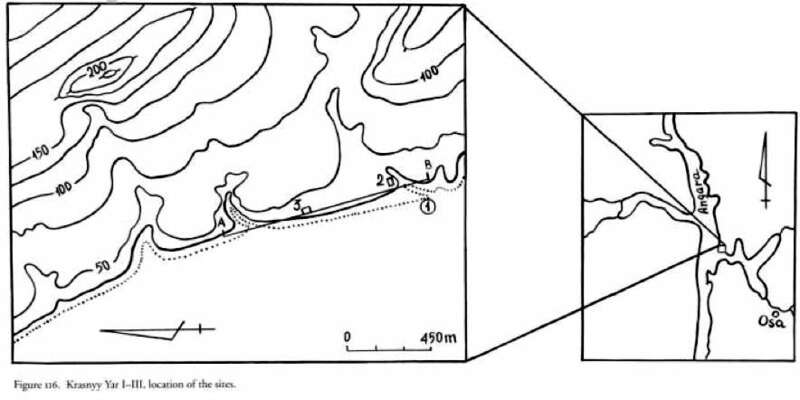 It should be noted that the Palaeolithic site of Krasnyi Iar, before the filling of the reservoir, was on the right bank of the Angara, 3 km below the mouth of the Osa River (its right tributary). At the present time, 2 km north of Bil'chirskii Bay, which is at the confluence of the Osa and the Angara. The cultural horizons were in the deposits of the 16-20 metre terrace with a steep 9-10 metre ledge falling abruptly to the flood plain of the Angara. From the east and south, in the suture part, the terrace contours with Berevochnaia ravine which divides it from the complex of high terraces. The 16-20 metre terrace rests against the latter with an even transition only in the northwest and south. Z. A. Abramova reported on the activities of the Palaeolithic Section of the Angara Archaeological Expedition during 1958-1959. Work was continued at the new site of Krasnyi IAr which had been discovered in 1957 by A. P. Okladnikov at the juncture of the Angara and Osa Rivers. Three clearly stratified horizons have been identified here, evidently belonging to a single culture later in time than that represented by Mal't a and Buret'. The upper horizon, discovered at a depth of 2.4 metres in in the southeastern part of the excavated area, takes the form of thin and very diffuse hearth spots that are filled with tiny fragments of burned bone. Finds consisted of individual quartzite tools, tiny chips of the same material and fragments of horn bearing traces of working. Below this, separated by a sterile layer of sand 45-50 cm in thickness, lay the main occupation level which covered the entire excavated area (260 sq.m.). This deposit was comparatively thin (5-7 cm) and thickly filled with scattered fragments of burned fuel shale; these sometimes formed round hearth spots 40-45 cm in diameter and lenticular in section. A number of small pits 8-12 cm in diameter and up to 15 cm deep were revealed in the process of stripping the occupation level. 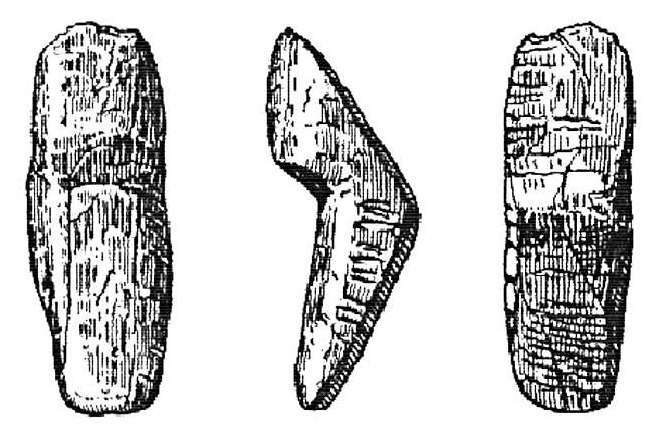 The Krasnyi IAr culture is characterised by flint core-scrapers of typically Siberian appearance and the miniature lamelles which had been removed from them; also by the occurrence in large numbers of chisel-like implements with bifacial trimming on the working edge, scrapers and cutting tools. Particularly noteworthy are the miniature perforators evidently used for fine work on bone. Bone artefacts include thin, carefully made needles with eyes and awls of cruder workmanship. There are distinctive beads, rectangular with a round hole in the centre, made of enamel from the teeth of large animals. A singular find was a bone figurine, schematically treated, somewhat reminiscent of similar objects from Magdalenian sites in western Europe. The fauna of this horizon is predominantly wild horse, with occasional reindeer, hare, arctic fox and ptarmigan. Remains of a third horizon were uncovered at a depth of 3.15 - 3.25 metres in the north-west portion of the excavation. It contained slabs of red sandstone (almost completely decomposed), individual skreblo (large scrapers) of quartzite, fragments of the same material and tiny unidentifiable bits of bone; there was a complete absence of charcoal. The archaeological expeditions organised in the region of lake Baikal by the Institute for History of Cultural Material, Academy of Sciences of USSR, and the Museum or Irkutsk, under the direction of A.P. Okladnikov, have published the discovery of a large number of prehistoric sites, particularly in the Angara Baikal by the Institute for History of Material Culture of the USSR Academy of Sciences Museum of lrkoutsk, under the direction of A. P. Okladnikov have determined the discovery of a large number of prehistoric sites, particularly in the valley of the Angara. It was during the course of one of these expeditions, there was discovered in 1957 the Paleolithic site of Krasnii lar, (or Krasnyy Yar) located on the right bank of the Angara, about 200 km downstream of Irkutsk, which itself is 72 kilometres from the outflow of the Angara River from Lake Baikal, and 12 km before the village of Malyshevka. This station has been the object of two major excavation campaigns, the first one in 1957 over an area of 40 m2, the second in 1959 covering an area of 220 m2. It was during the 1957 campaign that the statuette was found which is the subject of this note, and which essentially uses the work of Z.-A. Abramova (Abramova, 1959, 1962, 1962a). The station occupies a kind of small promontory formed by the second terrace of the Angara. It is in a sand/clay complex, whose depth exceeds 7m. In addition to some Neolithic remains collected in the layers above it, excavations have revealed the existence of three archaeological levels: one main bed located at a depth of 2.75 m to 2.85 m, and two secondary beds, one 2.5 m above it, and one 3.2 m below it. The two secondary levels are marked by a few faint indications of hearths, and have delivered extremely inferior material, mostly in quartzite. 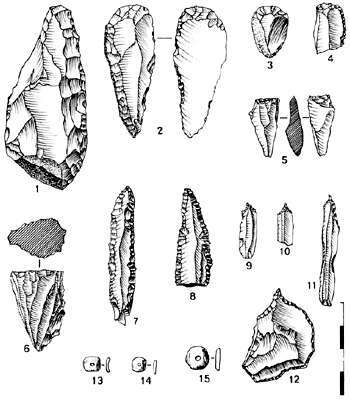 In the upper level, some (often fragmented) large racloirs (a scraper made from a large flint flake) one small grattoir (a scraper made from a flake or blade, retouched at the end and used probably for working or cleaning hides) and many flakes, much more abundant than blades. In the lower level, some fragments of racloirs and grattoirs, both levels have also provided a number of unidentifiable pieces of bone. The middle archaeological level, or main level has been observed, unlike the earlier levels, on the whole surface of the excavation, with a thickness averaging just under 10 cm. This level was particularly rich in the southwest part of the gisement, around 12 lenticular hearths (maximum diameter: 80 cm), arranged in two irregular lines. The archaeological soil layer was excavated, especially the areas around the hearths where there were found twenty or so small pits, ten to fifteen cm in diameter and whose depth did not exceed 26 cm. Apart from these pits and the particular disposition of the hearths, no other indication of habitation was detected. The presence, especially near the hearths, but also in the whole of the archaeological layer, of bituminous shale, more or less burnt, which, according Z.-A. Abramova, had been used as fuel. The main cultural layer contained many fragments of bone, of which only some have been identified. Neither mammoth nor rhinoceros were collected, but specimens were collected of horse, reindeer, bison (possibly Bison priscus, The Steppe Bison or steppe wisent), the Mountain or Arctic Hare, Lepus timidus, some carnivores (the brown bear) and birds (ptarmigan). The lithic material of this main level has been provided by several varieties of flint, quartzite, quartz, etc. 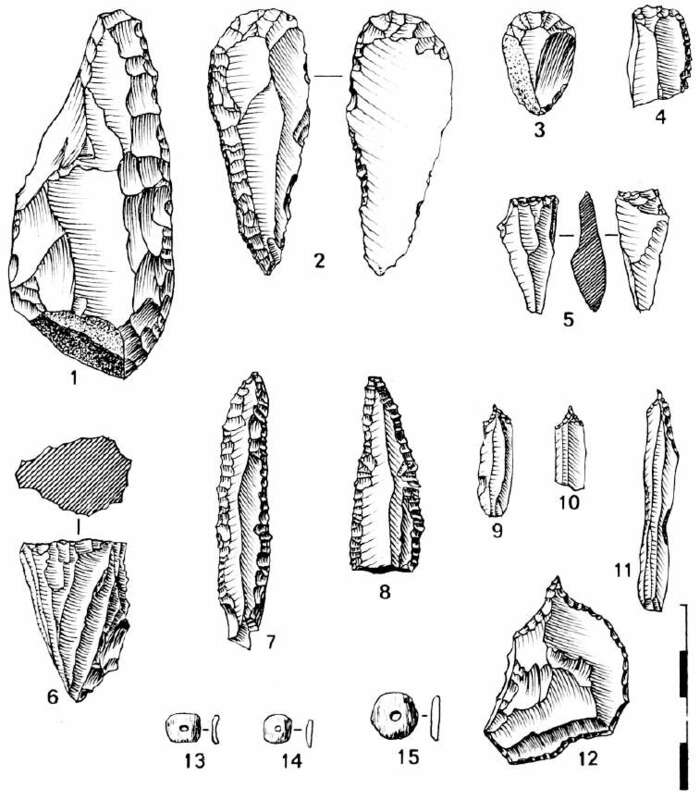 Flint knapping was performed on prismatic and pyramidal cores, producing quite small tools. As for the industry itself, it comprises grattoirs (scrapers) made on the end of blades, and especially on small flakes, reasonably large racloirs (scrapers on a flake), generally in quartzite (an inferior material - Don), some pieces, blades or flakes, retouched on two faces, the double retouch defining a sharp edge, straight or curvilinear, reminiscent of certain pieces from the Western Magdelanian, many perçoirs or borers, on blades or small flakes, more or less retouched, of which some could serve as a knife, but there were no obvious burins. a) a thin layer, it seems, of a shell, rectangular in shape, it was carefully polished on both sides, and the angles were rounded. dimensions: 14mm x 6mm x 1.5mm. b) Some flat beads, manufactured from the enamel of teeth of large animals, these are small plates, with a plano-convex section, more or less square with rounded or subcircular corners, perforated in their centre. Three whole examples and two fragments were collected. diameter of beads: 6.5mm to 11 mm. Thickness: 1.5 mm. It was in the main level that there was discovered in 1957, the most original piece of the station, a highly stylised female figure. It is a small figurine of bone, carefully polished, whose size is 37mm x 11mm x 8 mm. On the front, a projecting angle, located in the upper third of the height, represents the breasts, while the posterior face is divided into two equal flat surfaces, forming a blunt obtuse angle, which represents the protruding buttocks; transverse parallel striae, short and irregular, mark the posterior and the left side of the statuette. Archeological remains lie in cultural layers VII-V at the Krasnyy Yar site. Layer VI here, from a bone, dates to 19 100 ± 100 BP (GIN-5330) These cultural layers are found at the very base of the bed of sands and loams, 4-6m thick, that in the Osinsk region of the southern Angara cover the early Sartan solifluction horizons. Stratified sands and loams deformed by frost cracks were noted below the cultural layers at Krasnyy Yar II and III. The strata rest on unstratified loesslike medium loams. The bead preforms found in one of the hearths in layer VII are perforated on only one side (fig 118, nos 1,3) the opposite side was crumbled, leaving a depression with uneven, stepped edges. In the Angara area, remains of ostriches have not been found to date. All known finds have come fromtthe Trans-Baikal. Thus it is quite possible that the beads discovered at Krasnyy Yar I were made of imported material. Faunal remains were not numerous in Layer VII. They included 23 bones of reindeer and possibly aurochs (based on a fragment of large horn) as well as those of rodents identified by N. A. Erbaeva as Lagurus lagurus. Ornaments found in Layer VI were made of reindeer incisors. Nine of them were made on the incisors of young individuals, and lay in one little heap, suggesting that they may have been threaded on a string. A large pendant lay separately. It had two holes and four shallow cavities. One hole was broken. Three poorly preserved needle shaped ornaments were also recovered. Faunal remains from Layer VI are represented by rhinoceros, aurochs, and reindeer. Layers VI and VII belong to the same cultural stratum and are separated by a very small time interval. The spatial distribution of cultural remains in these layers reflects a part of a hunting settlement dating to the final stage of the Sartan Glaciation, between 20 000 and 18 000 years ago. The living complexes in these settlements had a linear orientation west-northwest or east-northeast. As at Mal'ta and Buret, these orientations did not correspond to that of the modern bank of the Angara River. At Krasnyy Yar, the angle between the line of the artefact accumulations and that of the river bank is over 50°. The dwellings here were kerbed with stones. Bones of bison and rhinoceros lay near the hearths (from 1 to 3 pieces) all of them on the south sides of the hearths. The outlines of the dwellings here conform to the "chum" or "tepee" type. They were light constructions and were not dug into the ground. Every hearth contains remains reflecting three independent behavioural sequences. The first one related to life near the hearths, inside or outside the dwellings. The second involved covering the hearths and some of the artefacts with slabs. And the third was a series of actions resulting in flakes and chips being deposited on the slabs. Material remains from Krasnyy Yar yielded three associations unusual for the Palaeolithic of Siberia. The first one consists of the ornament made from ostrich shells, pendants made from reindeer incisors, bones of rhinoceros and bison (or aurachs), rodents of the genus Lagarus representing a semi-arid landscape and last, the presence of slabs of combustible shale in the hearths. Such an association is unusual for the Palaeolithic, which we are accustomed to calling "arctic". Z. A. Abramova reported on the activities of the Palreolithic Section of the Angara Archreological Expedition during 1958-1959. Work was continued at the new site of Krasnyi IAr which had been discovered in 1957 by A. P. Okladnikov at the juncture of the Angara and Osa Rivers. Three clearly stratified horizons have been identified here, evidently belonging to a single culture later in time than that represented by Mal'ta and Buret'. The upper horizon, discovered at a depth of 2.4 m. in the southeastern part of the excavated area, takes the form of thin and very diffuse hearth spots that are filled with tiny fragments of burned bone. Finds consisted of individual quartzite tools, tiny chips of the same material and fragments of horn bearing traces of working. Below this, separated by a sterile layer of sand 45-50 cm. in thickness, lay the main occupation level which covered the entire excavated area (260 sq.m.). This deposit was comparatively thin (5-7 em.) and thickly filled with scattered fragments of burned fuel shale; these sometimes formed round hearth spots 40-45 em. in diameter and lenticular in section. A number of small pits 8-12 cm. in diameter and up to 15 cm. deep were revealed in the process of stripping the occupation level. 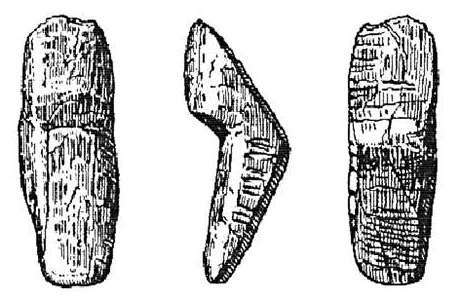 The Krasnyi IAr culture is characterized by flint core-scrapers of typically Siberian appearance and the miniature lamelles which had been removed from them; also by the occurrence in large numbers of chisel-like implements with bifacial trimming on the working edge, scrapers and cutting tools. Particularly noteworthy are the miniature perforators evidently used for fine work on bone. Bone artifacts include thin, carefully made needles with eyes and awls of cruder workmanship. There are distinctive beads, rectangular with a round hole in the centre, made of enamel from the teeth of large animals. A singular find was a bone figurine, schematically treated, somewhat reminiscent of similar objects from Magdalenian sites in western Europe. The fauna of this horizon is predominantly wild horse, with occasional reindeer, hare, arctic fox and ptarmigan. Remains of a third horizon were uncovered at a depth of 3.15-3.25 m. in the north-west portion of the excavation. It contained slabs of red sandstone (almost completely decomposed), individual skreblo (large scrapers) of quartzite, fragments of the same material and tiny unidentifiable bits of bone ; there was a complete absence of charcoal. Abramova, Z-A., 1959: Sur la question des figurations féminines à l'époque magdalénienne, Kratkie soobtchenia, no 76, Moscou, 1959, pp. 103-107, 2 fig. Abramova, Z-A., 1962: Krasnii Lar, nouvelle station paléolithique de l'Angara, Sovietskata Archeologiia, 3, Moscou, 1962, pp. 147-156, 5 fig. Delporte, H., 1965: La statuette féminine de Krasnii lar (Sibérie) et le Paléolithique supérieur de Sibérie. Bulletin de la Société préhistorique française 1965, tome 62, N. 1. Études et Travaux. pp. 118-129.